Here are four chicken wing sauce recipes that are truly amazing. These chicken wing sauce are a great change and addition to hot sauce wings at a party. Different than the traditional flavors. We have spicy garlic, garlic Parmesan, lemon and a spicy mustard, all four chicken wings sauces are delightful! All four chicken wing sauces are unique and Curt's recipes, he did an awesome job! This was a real treat for me to have my son Curt, wanting to do this second guest post, his first post here, was an appetizer, Curt's loaded potato skins and this time a variety of different flavored wings. Over the last few months he has been inspired to make many different sauces with his Italian background and eating these types of sauces on some of my Chicken recipes. He has tried all of them on several friends and family get together s.
I honestly can't choose the one I like the best, they are full of great flavor and delicious, not that I'm partial, but they are pretty darn good even if I am his mom to say so and he has done a great job with all of them! Curt said to tell everyone, give them a try let us know what you think! He makes the best chicken wings sauces! Curt is getting the garlic ready that goes into all the recipes. None of the wings have a thing on them, they are all fried first naked, then immediately submersed in one of the sauces. Saute the garlic till golden, just a little tip, never brown the garlic or let it scorch it will make the sauce taste burnt. Be very careful while frying wings not to put too many at a time, the oil will overflow. Six to seven at a time in a small fryer is perfect. Each batch of wings is coated while still very hot right into the flavored sauces. Here is a little variety of flavors. Garlic Parmesan wings, Marsala Wings, Lemon Garlic, Gold and Spicy. The flavors really enhance any fried wing, we loved them all! All of these bold sauce flavors enhance the chicken wings to the next level. The flavors absorb right into the wings after they are fried. Perfect for an appetizer or dinner party orderve. You can grill your wings or even bake them first. The sauces still taste great on any method of cooking. Even using an Air Fryer! Recipes are just a guideline. Make them as spicy or mild as you want by adjusting the ingredients. I just love the lemon chicken, but add a little more heat by using cayenne pepper in my sauce. You will have just a little sauce instead of heavy coated wings. These Chicken Wing Sauce Flavors are quite unique in flavor. You can always try some of the other dipping sauce recipes here that Curt developed. Saute garlic in olive oil, add butter, cayenne pepper, garlic powder marsala wine..cook down for 2 minutes . Stir hot fried wings into sauce. Sprinkle with parsley. 2 whole garlic cloves roasted (Drizzle garlic with olive oil, then wrap in aluminum foil. Bake in preheated oven for 1 hour.) Stir hot fried wings into sauce. Stir hot fried wings into sauce. Stir hot fried wings into sauce. Optional: Sprinkle with more black pepper. Fry wings, bake or grill. Each batch of wings is coated while still very hot. Add them right into any of these flavored sauces. They all look great and looks like he is a boy after his momma's heart! allthe wings are are the best!and your son,claudia,is amazing! Oh wow! Looks delicious! I could go for some of that good stuff! 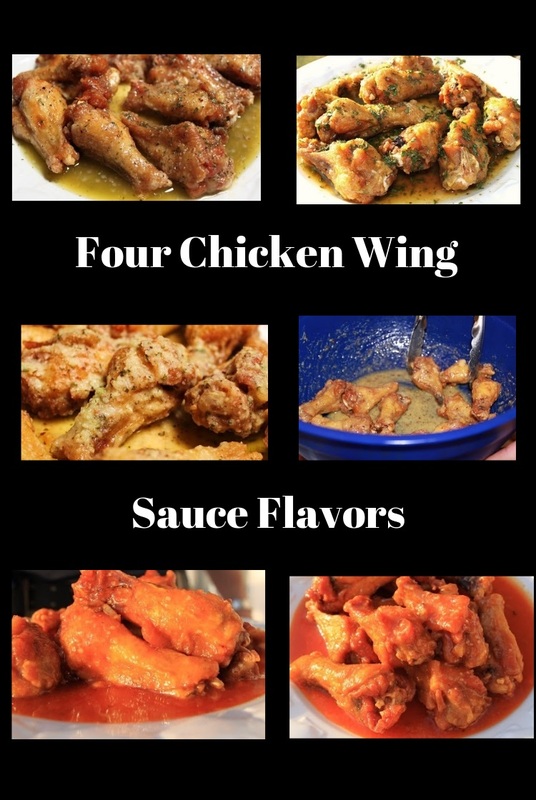 Wow, terrific recipes for wings! Your son is a wonderful cook, Claudia! I'm handing the pots and pans to my son tonight! I love all the flavors - now that Marsala sauce would be a new one. I'd love to try that. Congratulations, looks like your son picked his mom taste for cooking and good food. Yummy wings! Wow, they all look gorfeous, especially the lemon ones. You have so many yummy reasons to be proud of him!! Wow! They all sound fabulous! Oh lord, you got me in my weak spot. I love wings, anyway anyhow! these look great. These all look so good but I have to say that the Italian herbs and Parmesan ones caught my eye :) I have to give them a try next time I get some wings to cook! Curt makes me wish I ate chicken!! But I think the garlic marsala sauce would be fab on catfish, don't you? Those wing sauces look crazy good. I think all 4 flavors look awesome. May have to get out my fryer soon. Tell Curt he's welcome to come down and cook wings for us anytime! I take a dozen of those fabulous looking Marsala wings please. Each one looks better than the next. I think I would try the lemon pepper first. yum! Perfect for a barbeque too! Isn't that enough to make any mother's heart swell with pride? :) I love all four flavours, couldn't choose just one! Well done, Curt! I would not leave a bit of that sauce uneaten. A festival of wings! So nice to have a son who cooks for you! Wow !! I just love all of them..
My mouth is watering. These look amazing. All 4 of these recipes look fantastic. I may have to try 1 or 2 or 4 this weekend.